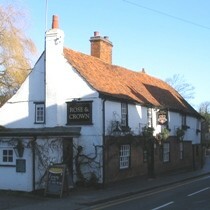 The Rose and Crown in St Albans is a large traditional pub in the St Michaels area of St Albans. Its character features include low ceilings with beams, a wood floor and a real fire. The pub is split into two separate rooms that are both used predominantly for drinking. The room on the right has a dartboard. At the time of the visit Adnams, Green King IPA, Spitfire and London Pride were available. Home cooked food is served lunchtimes and evenings until 8pm with the menu consisting of more traditional pub style food. The garden at the back is small with about four tables and some lovely flowering roses and other plants. This pub tends to be quieter than its neighbour, the Six Bells, but it is a fine, welcoming place to drink. The Rose and Crown has regular live music evenings when the pub can get very busy.